The Slimline is WhisperKOOL's quietest interior venting self contained unit available. Developed to fit into the often unused space between the cellar door and ceiling, giving the collector maximum storage capacity. The system is equipped with WhisperKOOL's Platinum Series controller utilizing Advanced System Protection Technology. This features a series of strategically placed monitoring probes, which insure efficient performance and long cooling unit life. With efficiency in mind, the Slimline uses less power than most traditional units while having the ability to cool cellars up to 350 cubic feet. Do you need to have a drain for condensation or excess water? BEST ANSWER: Thank you for your inquiry, yes the WhisperKool Slimline does include a drain line from the back of the unit. We live in a very dry climate. Does it need a water supply to put humidity into the room? There is an upgrade humidification available to purchase which will require you to run a water line to it. The picture they show of this unit don't show the power cord and drain line, but in the owners manual they do. Do you actually see the power cable and drain line on the cold side? That's what's holding me back from buying one..
BEST ANSWER: Yes, the power cord and drain line are both on the cool side and you will see them along with the bottle temp cord which lets the unit know that it's reached it's desired temp. I converted a walk in pantry in my home to a walk in wine cellar. So far it's worked great. Haven't had any use for the drain yet but it's there with a Home Depot bucket in case it is ever needed. We live in a very dry area with zero humidity. Yes. The unit does work very, very well. I used it for a closet conversion. Be sure to calculate all your heat losses for your room/cellar/closet. It sounds like you want a wine room to sit in. You may want/need more cooling capacity in that case. I derated the cooling capacity by 30% to ensure the unit never overloads and to keep my power bill low. Yes you can see the power cord and drain line from the inside of your cellar. I put the outlet next to the unit and the drain line is fed through the wall very close to the unit. Both are fairly discreet and since it is above the door high up you don't really see them. I have been very pleased with the unit. Where did you put the temperature probe? I made a corner shelf next to the door on the same plane as the unit and put the probe in the bottle on the shelf. Works perfect. The condensate line and electrical will be seen from inside of the cellar. A sump pump can be used to conceal the drain and the outlet can be positioned near the cord so it will not be that visible. Yes, the power cable and drain line are on the cold side and they are visible. Yes you will see the drain line and power cord on the cold side. How far does the unit protrude into the room on the exhaust side? BEST ANSWER: Figure about 6"
We have a very small space that is15 inches deep and backs up to our kitchen. There is no room for a unit that is 15 inches deep! What do people do when they have limited space for a cooling unit? BEST ANSWER: Put it in the attic if you can. Get a ducted unit and then run the ducts outside for exhaust and the ducts down into the cellar. Make sure you get an extreme unit that is capable of lowering the temperature adequately (I have the WhisperCool 5000ir and it works great). I would also add ventilation in your attic to reduce the heat load on the unit. It would be best to discuss this space and details with a storage consultant. Please call us at 1-800-356-8466 so that we can help. If we can install the unit on an exterior wall, does that work as well? I own a slimline 2500. Cellar is <300 cubic feet. Unit cools very well, but no condensation comes of the line. It exhausts into the living area at 76F. Underneath my house I now have condensation as the floor is hardwood. Please advise on how I should proceed and if the unit should be discharging condensation. It never has over two years. Should it have condensation coming down the drip line? What is the maximum decibel level that the cooling unit produces? 53dba Condenser Side and 59dba Evap Side. Can this unit be used in a commercial application for a restaurant? Have approx. 650 cf of volume but have close to 1700 bottles of wine? 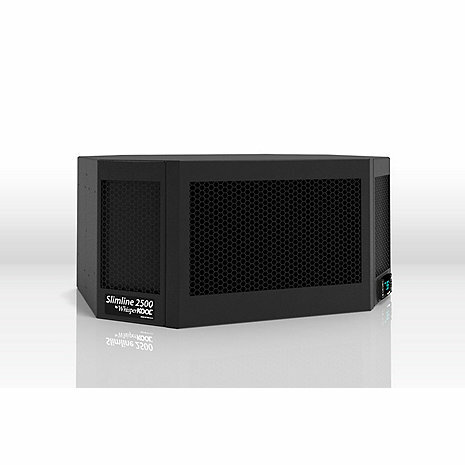 BEST ANSWER: The Slimline 2500 is too small if your are cooling a space greater than 650 cubic foot. I would recommend a system that can handle up to 1000 cubic feet like a Whisperkool SC 4000i. can it be mounted in the ceiling facing downward to the ground? BEST ANSWER: Unfortunately the model must be slid into the wall and blow out into the cellar. Venting to the exterior for this specific cooling unit is not recommended. BEST ANSWER: These type of through the wall units must vent to an interior adjacent space where both the intake and outake air is coming from a conditioned space and the ambient temperature is less than 85 degrees. Could the exhaust be ducted from the back of the unit? BEST ANSWER: Yes, the exhaust emits from the back of the unit to a larger interior conditioned space. how long is the power cord? My outlet appears to be on the wrong side - left side inside facing the unit. Your cord, at least in the picture, comes out of the right side. To the 1 star review if your cellar was 300sf than at 6 foot ceilings that's 1800 cf. Unit is rated for 350 CUBIC FEET proper insulation would help as well don't blame the manufacturer for your poor math skills. UNIT IS PERFECT FOR INTENDED PURPOSE CHECK YOUR SPECS ?????????? Installed to cover 200sq/ft room for 500 bottles of wine. Unit installation was easy and unit performs as advertised. I would highly recommend this unit for small wine cellars. I received and installed the WhisperKool 2500 recently. The unit was very well packaged and included mounting brackets and operators manual (installation instructions too). Very pleased with initial use, however because the weather is so mild (cool) I have not used it beyond the initial day. During that day it ran smooth. Satisfied with the sound level too. It was necessary for me to use this unit based on the size and configuration of my cellar which is 300 sf., is below ground and not on the sunny side of my home. During the winter, the temperature will not go below 57 degrees. During the late spring to early fall, I am lucky if I can keep it below 65 degrees. It has been necessary for me to install a fan to blow cool air across the exterior grills 24x7x365. I have had the unit replaced but even though I coninue to call and ask for assistance, or have someone come to my home and review the installation, I get no where. I have spoken to the President of the company who tells someone to get I touch with me and I wait months to hear anything. The manufacturer does not care and I have 500 bottles of wine that are at serious risk. I would not recommend using this unit unless you can guarantee that the room outside of the cellar will not go above 68 degrees.